The Indianapolis Motor Speedway Museum invites the public, Museum members and the racing community to a special presentation, “Team Penske’s First 500,” honoring 50 years of winning for team owner Roger Penske’s namesake racing organization. 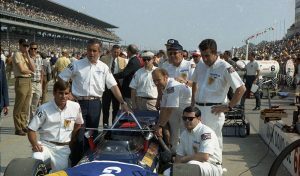 Roger Penske, standing left, with his team on 1969 Indy 500 Race Day. The mini-exhibit officially opens March 29 and runs through mid-November. “Team Penske’s First 500” honors a trio of milestones: the team’s 50th anniversary at the Indianapolis 500 presented by Gainbridge, Team Penske’s 500th win in major racing competition and a “Penske sweep” of major NASCAR Cup Series and NTT IndyCar Series events at Indianapolis Motor Speedway in 2018. In May 1969, while a now-iconic driver named Mario Andretti took the checkered flag at the Indianapolis 500, Roger Penske entered a car in the Indianapolis 500 for the first time under the Team Penske banner, beginning a campaign that has rewritten North American motorsports history. Penske was inducted in the IMS Hall of Fame in 2002. “Team Penske’s First 500” features five cars and historic memorabilia and runs concurrently with the Museum’s major 2019 exhibit honoring Andretti. Opening May 1, “Mario Andretti: ICON” presented by Shell V-Power NiTRO+ Premium Gasoline celebrates his 1969 “500” triumph and incredible driving career, which included a period with Team Penske. No. 12 Verizon Team Penske Chevy-powered Dallara, winner of the 2018 INDYCAR Grand Prix (2.439-mile IMS road course) and the 102nd Indianapolis 500 presented by Gainbridge. No. 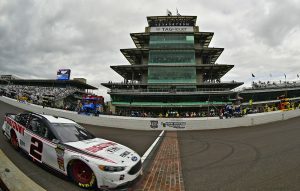 2 Discount Tire Ford Fusion driven by Brad Keselowski to victory at the 2018 Big Machine Vodka 400 at the Brickyard Powered by Florida Georgia Line, the first Cup Series win at IMS for Team Penske. No. 2 Autotrader Ford Fusion driven by Keselowski to Team Penske’s 500th major win on Sept. 16, 2018 at the Las Vegas Motor Speedway NASCAR Cup Series race. Donohue qualified fourth and finished seventh at Indy in 1969 – despite an electrical issue requiring a pit stop that consumed 10 minutes. He was named Rookie of the Year. In 1972, Donohue gave Penske the first of a record-17 Indianapolis 500 victories with an Offy-powered McLaren, setting a race-record average speed of 162.962 mph in the process. 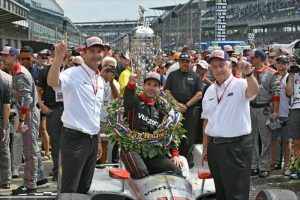 Team Penske’s dominance at highly competitive Indianapolis is summed up with one statistic: Three team owners are tied for second place in the “most wins” category – with five each. Fellow IMS Hall of Famers Lou Moore, Chip Ganassi and Michael Andretti currently occupy the second spot. Moore was dominant at the “500” before and after World War II, while Ganassi and Andretti remain fierce rivals to Penske in today’s NTT IndyCar Series.